That’s what Happy Again! The Art of Positive Separation is all about. Eveline Jurry is an international best-selling self-help author, creator of the Positive Separation Method™ and an expert in applying practical action to create greater happiness and positivity in all areas of life. Through her consulting practice and books, she specializes in helping individuals in distress get back on track after a breakup or divorce. She also consults with businesses and governments on her Positive Separation Method. Personable and media-savvy, Eveline and her work has been praised by best-selling self-help authors Jack Canfield, John Gray, Katherine Woodward Thomas, Marci Shimoff, Debra Poneman, Janet Bray Attwood and Chris Attwood. Marci Shimoff, New York Times #1 best-selling author of Happy for No Reason, Love for No Reason, and Chicken Soup for the Woman’s Soul; co founder of Your Year of Miracles. Eveline Jurry is an international best-selling self-help author, creator of the Positive Separation Method™ and an expert in applying practical action to create greater happiness and positivity in all areas of life. Eveline’s latest book Happy Again! The Art of Positive Separation, now available worldwide, is written in a down-to-earth, no-nonsense enthusiastic style with European flair. The powerful, step-by-step guide provides a blueprint for navigating daily life during or after a breakup or divorce working in the meantime towards a brighter, happier, more fulfilling future. Her work has been praised by best-selling self-help authors Jack Canfield, John Gray, Katherine Woodward Thomas, Marci Shimoff, Debra Poneman, Janet Bray Attwood and Chris Attwood. Her first book, Je Wordt Weer Gelukkig (You Will Be Happy Again, 2013, Bruna/Lev) was a best-seller in the Netherlands, followed by a successful shorter version. Eveline currently lives in Amsterdam, the Netherlands, with her partner John and their blended family of nine. Eveline inspires, trains and coaches individuals, professionals, lawyers, companies and governments on the art of positive separation and how to empower vulnerable adults in separation situations. With the projects of the website #ShareHappyAgain, Eveline shares and inspires individuals and professionals worldwide. The first project ‘100 Books Happy Again! Traveling Around the World’ started on September 1, 2018. The second project, the free download ‘QuickStart to Your Happy Future’ will be available in the Fall 2018. The extensive download is a proactive and preventive plan with tools to empower and improve people’s daily functioning when going through the hard process of a breakup, separation or divorce. Born in the Netherlands and educated in the Netherlands and England, she holds a master’s degree in corporate law from the University of Leiden, The Netherlands. Eveline currently lives in Amsterdam, the Netherlands, with her partner John and their blended family of nine. 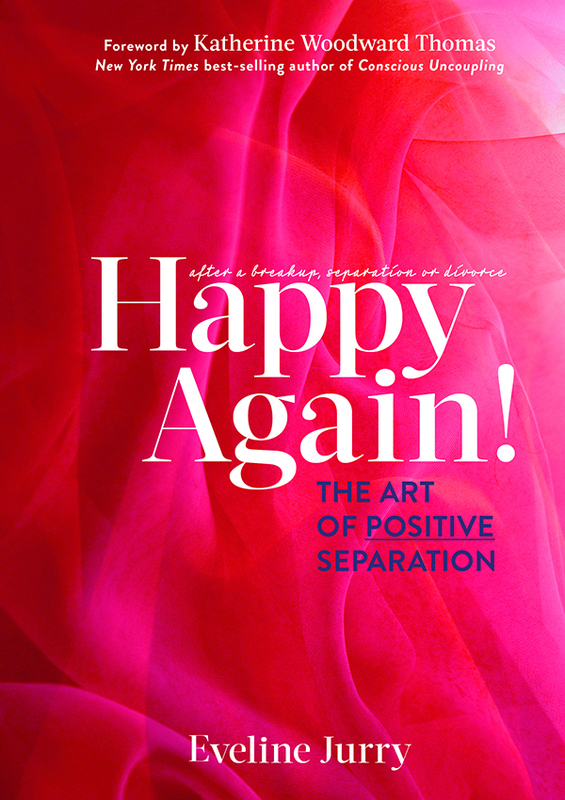 Are you looking for a definitive, step-by-step guide to creating a positive separation and find happiness again in the near future? You've found it! Happy Again! The Art of Positive Separationis Eveline Jurry's newest book, an updated and expanded version of her Dutch best-seller, Je Wordt Weer Gelukkig. In it, you will learn the five steps of Jurry's proven Positive Separation Method™, receiving the guidance and tools needed to navigate the challenging process of divorce, breakup or separation in an empowered way and create a happy future. Combining practical "baby steps," self-examination and consciously directed vision, her Method will help you step out of the chaos and drama and step into your vision of a new, happy life. Jurry's loving and no-nonsense approach will quickly pull you into a positive spiral of forward-moving thoughts, emotions and actions. 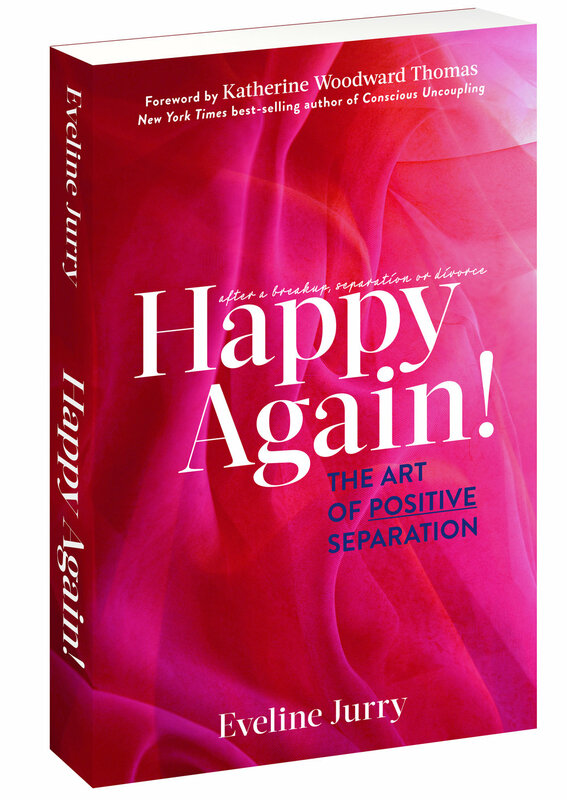 The foreword of Happy Again!is written by Katherine Woodward Thomas, MA, MFT, the New York Timesbest-selling author of Conscious Uncoupling: 5 Steps to Living Happily Even After. Jurry’s practical steps enhance and support the emotional techniques Thomas and other self-help authors teach. What is the biggest myth you see when it comes to having a healthy separation or divorce? What are the top fears people have after a divorce or break up and how can they get past these fears? What does Positive Separation mean? What inspired you to create your Positive Separation Method™? How is your Method helping your clients and readers of your book Happy Again! The Art of Positive Separation? Happy Again! is an instruction manual for navigating the challenging process of finding happiness after a breakup or divorce. What are the five steps of your Positive Separation Method? Can you share a lesson you learned or a tool you used early on in your divorce that still positively impacts your happiness today? You talk about creating a Winning Team. Why is a Winning Team of friends, family, professionals and resources so important to positive separation? What are some of the guidelines for choosing the members of a Winning Team? Who should never be part of a Winning Team? Why? What’s the best thing that friends and family members can do to help loved ones feel happy again after going through a breakup or divorce? What are some small, simple ways to create positive experiences that can help people take care of themselves during a breakup or divorce? How quickly can someone get back on track if they follow your Method and tips? What’s the most important question people should ask themselves when it comes to getting back on track after divorce or separation and being happy again? What’s your best advice for parents who may want to work with your Method? How does the Method with practical steps enhance and support the emotional techniques Thomas with Conscious Uncoupling and other self-help authors teach? What’s the best advice that friends and family members can give when a loved one is in a breakup or divorce to navigate the new situation and high emotions? You profile internationally acclaimed self-help authors and thought leaders in your book including motivational speaker and author Lisa Nichols, and Marci Shimoff and Debra Poneman, best-selling authors and co-founders of Your Year of Miracles to name a few.What did you notice or learn from their stories that either surprised or validated your beliefs about achieving happiness after a split? You’re sending out 100s of free copies of Happy Again! worldwide. Why are you doing that and what do you hope to accomplish?